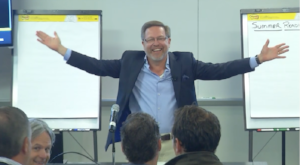 That’s what CEO Verne Harnish shared recently with hundreds of his Gazelle partners on six continents. You may have heard of Verne. He’s the guy who founded the world-renowned Young Entrepreneurs' Organization (YEO), which is now called EO, and chaired the “Birthing of Giants” , a premier executive education program at MIT, for 15 years. Gazelle is the global executive education and coaching company he founded in 1997 to help mid-market companies execute their strategic plans. He wrote Scaling Up, Mastering the Rockefeller Habits and, along with the editors of Fortune, also authored The Greatest Business Decisions of All Time, for which Jim Collins wrote the foreword. A regular columnist for Fortune, he’s also known globally as syndicated columnist “Growth Guy”. Many years ago you asked the question in our class "Who out there has a coach?” Only 3 put up their hands and I was one of them. Well, 14 years later, this is one of the most important decisions I ever made. Thank you for pushing us all on this point. Since that time, I have been able to set up my business to run without me. Nigel engaged Gazelles Certiﬁed coach Kevin Lawrence (Coach Kevin!) and the rest is history. In 2014/15, Nigel took a year off and travelled with his family to 17 countries around the world, giving them what he termed "the most amazing family experience possible." He noted that his business is still going strong and, given his free time, he's been able to write a book of his learnings and adventures along with creating an App to help save our global coast lines. Take That Leap: Risking It All for What Really Matters is the title of Nigel Bennett's just released excellent and adventure-packed book. A fun and insightful read. Without Coach Kevin none of this would have been possible.. so a big thank you! No one has ever achieved peak performance without a coach. Congrats, Nigel, on all your success!"